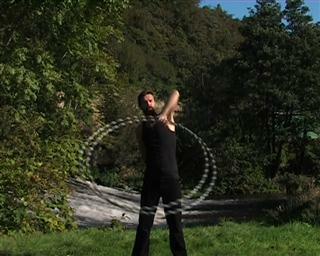 From hooping overhead it's possible to go into many off the body moves. 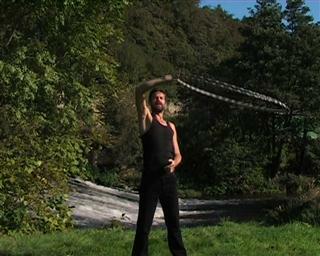 One simple move is to take the hoop down to a back pass at waist height and then return to overhead. This move involves a very common movement called the curl. Although common it can be difficult to do at first. During this movement it helps to think of the ring of the hoop as the rim of a bowl. The bowl is full of water and you don't want to spill any. You need to keep the hoop horizontal and level throughout the movement. Because the hoop is travelling down and up there is a tendency to angle it but this will compromise the movement. This movement must start with hand one, which for me is the right hand as the hoop is circling in a clockwise direction. 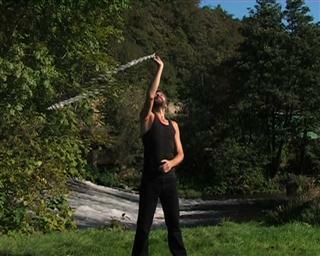 From hooping on hand one, close your grip around the hoop when the space is out to the side. 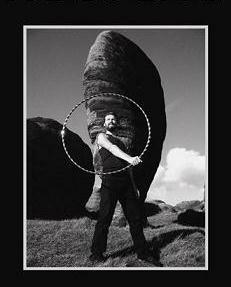 With the hoop gripped keep it circling for 180 degrees until the space is out to the opposite side. from the wrist to the elbow and then the shoulder. Let your hand drop but keep your elbow high. 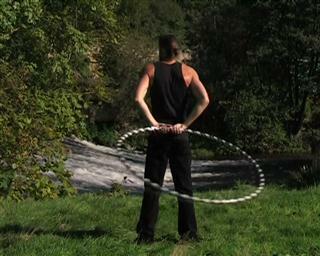 Remember to keep the hoop flat, this is the place you are most likely to twist it. Practise this part of the move with a book or bowl in your hand. Start with your palm upward overhead and curl it downward keeping your palm facing upward. Keep your hands close to your body and pass the hoop behind your back. Make sure to keep the hoop flat and your palms facing upward through the pass. Here you can see the backpass more clearly. Close to the body, elbows bent, palms facing upward. To take the hoop back up, you make the some movement in reverse. I think this is easier and can help you to understand how it should feel when flowing. After taking the hoop back up you can hoop on hand two or pass and run again.